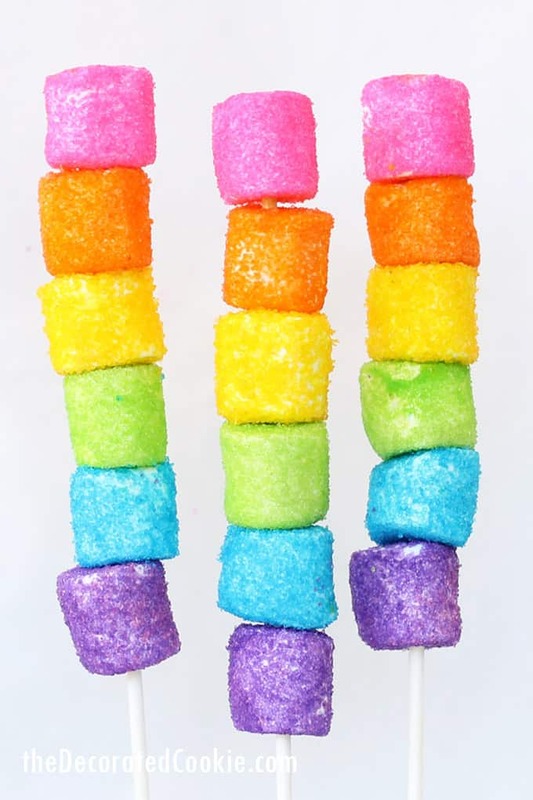 Rainbow marshmallow kabobs! 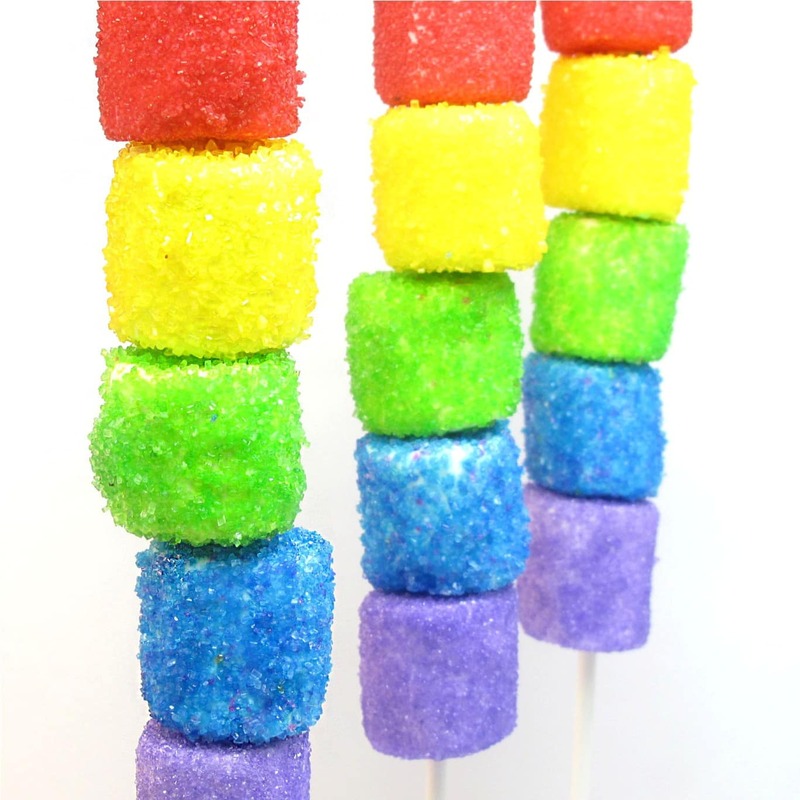 Sprinkle-coated marshmallows. 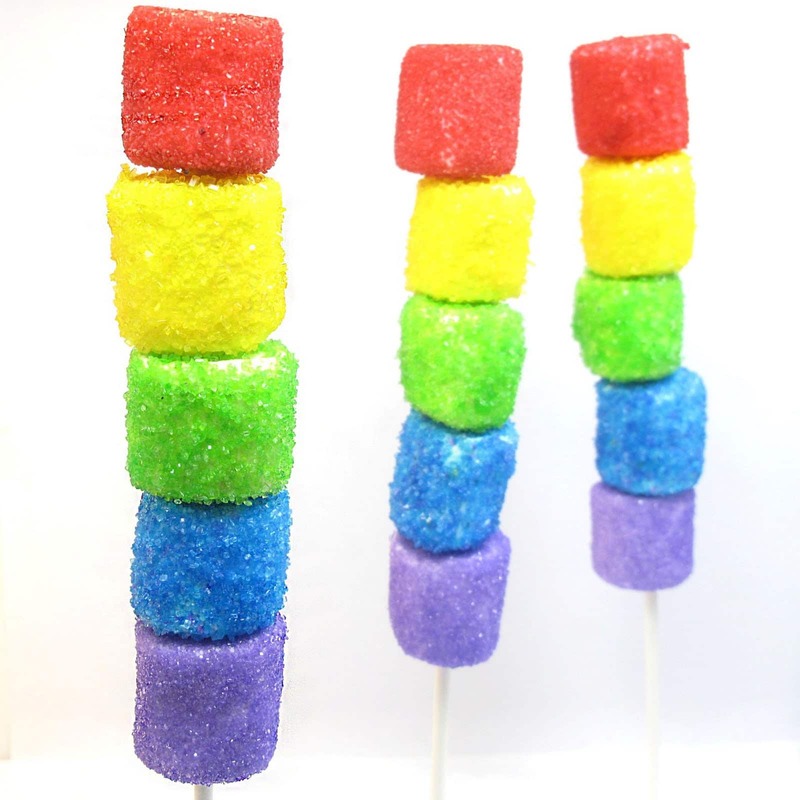 Sparkly rainbow marshmallow kabobs! Coat marshmallows in sprinkles and stack on a lollipop stick. So these sparkly rainbow marshmallow kabobs have been such a hit over the years, I’m back with some updates! I made some more… and, I made a video for those of you more visually inclined. The regular how-tos are still below if you’re more of a traditionalist. And by the way, as mentioned below, years later, my daughter is STILL really into rainbows. And unicorns and fairies. These came about mostly my accident. I was trying something else that didn’t work and ended up with these rays of sunshine. My daughter is into unicorns and rainbows now (ah, does a ’80s kid like me proud) so I’m hoping she still is at her next birthday. See below for written instructions. But if you still need some more rainbow-y marshmallow ideas, use this same method to make unicorn-approved rainbow s’mores dip! It’s amazing. And grown-ups, did you know you can use vodka instead of water here? 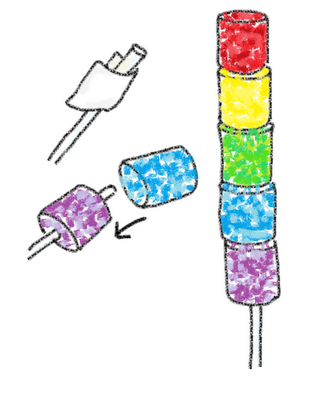 Check out these vodka-dipped rainbow marshmallow pops. *I used red, yellow, green, blue and purple sprinkles. In the updated version, I also use pink instead of red, and I add orange. 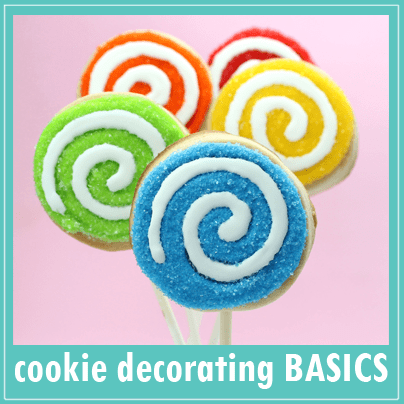 Find 12-inch lollipop sticks in the craft store or online. Have ready a bowl of water, a paper towel, an empty bowl or plate, an open container of any color sprinkles and a piece of wax paper. Skewer a marshmallow at one of the flat ends with a toothpick. Use the toothpick to hold the marshmallow, submerge the marshmallow fully in the water quickly, and remove. Dab the excess water on the paper towel, hold the marshmallow over the empty bowl and sprinkle generously with sprinkles to entirely coat the marshmallow. Carefully remove the marshmallow from the toothpick and set on a piece of wax paper to dry. Let dry several hours. Repeat with more marshmallows in the different colors. Dab a paper towel in Crisco and grease the top half of a lollipop stick. 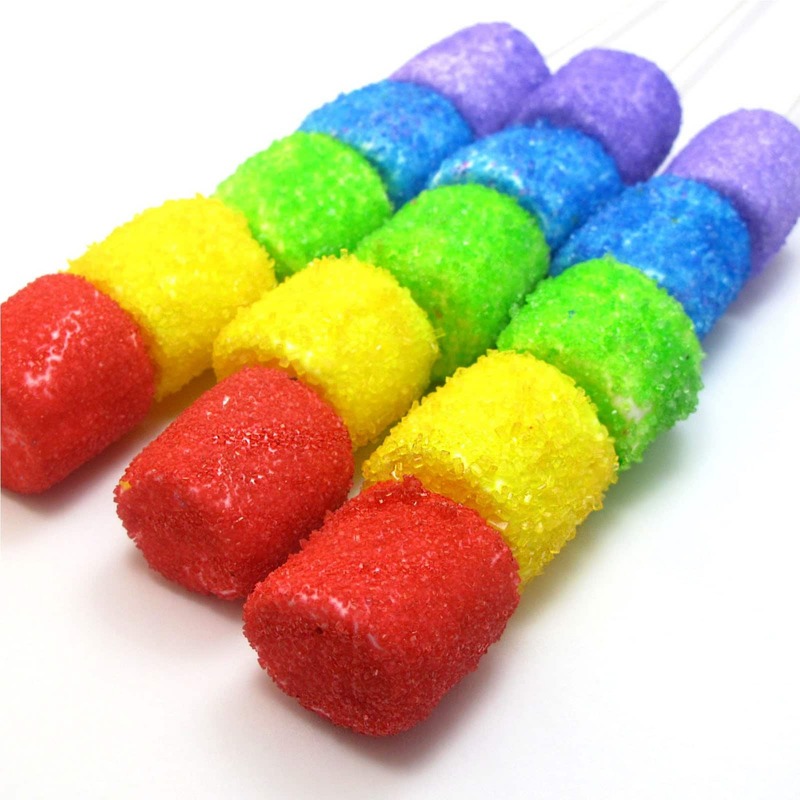 Slide the rainbow of marshmallows on the stick. Tips: Don’t skip the Crisco, it makes this step much easier. And, insert the lollipop stick into the hole left by the toothpick. Ta da! 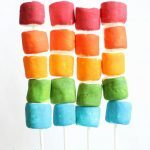 Rainbow marshmallow awesomeness. 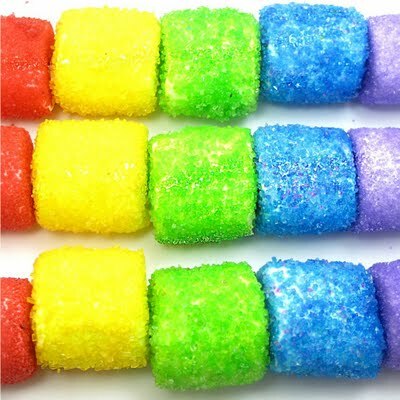 The sprinkles make a nice coating on these marshmallows that keep the outside crunchy and the inside soft. Once they are dry, you may store these up to three days in advance of serving. I like to line a large, flat Tupperware container with parchment or wax paper, place the kabobs in a single layer and cover. gonna have to try these out! my daughter loves marshmallows, and what is better than an bright one? I hope my daughter loves the 80's as much as I do too! These are so pretty. I love rainbows and easy crafts. thats' really cool – I like those. What's more, it's something that can easily be done by kids. I need to buy sanding sugar ! These are awesome! 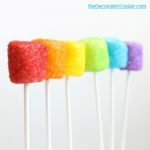 I'm so excited to make these for the pride parade! i am especially curious to know what you were trying to make originally, before accidentally making these! Thanks all! Go '80s! And rainbows. Agree, Hayley, easy to tote around, too! Unikornz… you'll see in a few weeks. first of all… what a lovely blog! second… thanks so much for linking my itsy bitsy carrot patch project up– so sweet of you! These have Punky Brewster written all over them! 🙂 Love that! 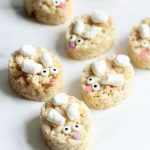 You had me at "Glitter up your marshmallows"
Love these they are adorable, think I will make them in pastel colors for Easter next weekend! I think I need to have a stash of marshmallows at all times now! How fun! These are GREAT! My kiddos LOVE anything on a stick. The other night Caleb woke up EARLY and had marshmallows for breakfast, LOL, you'd be his kind of gal! Wait, they aren't part of the food pyramid? Stumbling and pinning this post for sure!! question on the fantastic sparkly kabobs: how far in advance do you think i could make them? i was worried about the sanding sugar running if i stored air tight. but dont want the marshmellows to get stale if i leave them out. Nicole, I'd say up to 2 days uncovered. I think rather risk staler marshmallows than the effect of moisture on the sprinkles in an air-tight container. The sprinkles (well coated) create a sort of shell that helps preserve the marshmallows soft center. 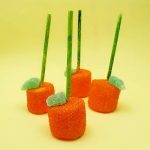 You can also wrap the marshmallows with cellophane favor bags, tie with ribbon at the base of the marshmallows (so the stick sticks out). Not air tight, so maybe even up to 3 days that way. Bonus, cute favor. Too fun! Love the rainbow – totally looks like Rainbow Brite from the 80s, too cute! 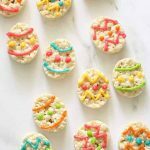 I'm sure you could dust them with sprinkles in other color themes too. These are so fun and colorful! love it! Love it! Going to have to try my own version soon. Will link to you when I do. Made these tonight for a bbq. Next thing I know my sisters-in-law are holding them over the hot coals. Roasted glittered marshmallows! The inside got melty while the outside stayed crunchy. Amazing! Ha, brilliance! So going to try if I find myself near an open flame with one of these. So cool! awesome idea. they look so fun. "poor orange and indigo got the shaft." This looks like a lot of fun. We just found out that my son is allergic to wheat. 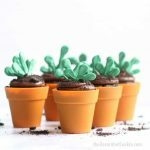 I have been looking for some fun food crafts that are wheat free. Thanks so much! Do you have to make these right before serving them? Don’t the marshmallows get hard otherwise? oops I read from the bottom up and saw you answered my question!!! Can’t wait to try them! Way ahead of me Becca! But I’ve rethought the tupperware idea since then. I’ve put them overnight in tupperware and they were totally fine the next day! Going to try them the tupperware way! Thanks for answering!! My daughter is having a rainbow birthday party tomorrow. I just finished step one, and they’re going to be great. Have to share, though–after following the directions exactly for the first color, I went the “shake-n-bake” route to get the sprinkles on the marshmallows for the rest. After dunking in water and dabbing dry, I dropped them into a baggie with the color sugar and shook it. It was awesome. Far less tedious and more even sugaring! Love it… GREAT idea!!! Thanks for the tip :). 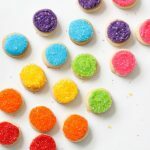 i’m having a rainbow treasure hunt party for my six year old’s bday party tomorrow — made these with her (so much fun!) and we’re going to make a “fluffy bunny” game out of them! it did take a little while to make 23 skewers. 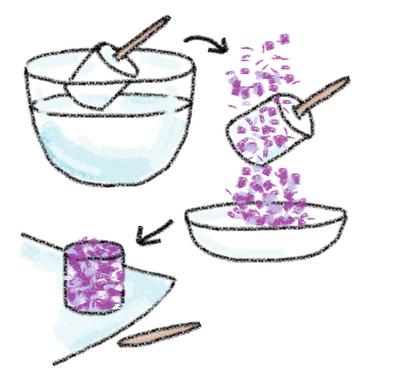 tip: if you buy sprinkles, make sure the opening is wide, it took awhile to get the sprinkles out of the jars. 🙂 and it takes A LOT of sprinkles. they’re awesome though! Have a great party, Traci!! Yep, 23 times 5 marshmallows per kabob… go you for the patience! And yes, good tip. I’m VERY generous with my sprinkle coating! I usually just take off that plastic part and pour the sprinkle on right from the jar (though frugal me then uses a funnel to dump the leftover sprinkles back in the jar). This are so cute… already trying to figure out how to use them for my daughter’s birthday next February. In the meantime, a friend recently asked me to do lego pops for he son’s birthday this weekend. I’m thinking just one yellow sugared marshmallow on each stick with eyes and such drawn on might just do the trick. These are gorgeous! I’m wondering if it would work with miniature marshmallows and then put them in a clear bag as a take home party favor. How did you get the sugar to be colored?! When I do crafts, I do them for A LOT of kiddos with my clinic (like 100-200). We like to do them for holidays. I loved this craft! 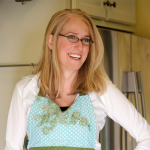 I used kabob skewers (much cheaper and longer, too!) instead of lolipop sticks, was able to put 6 or more marshmallows on them and didn’t really need the crisco. Also made my own sprinkles with some food coloring and everyday sugar (and some muscle)in all the colors I wanted. Put the colored sugar in ziploc and shook each marshmallow after it was wet. Worked fairly well, especially for a bunch of kids. And the kids really love how bright and tasty the craft was. Definately recommend! Love them! Super cute and colorful! 🙂 Where can you get sanding sugar? Hi Gaby, You can use any sprinkles! I get mine at the craft store. My son is 13 and his favorite sweet thing is marshmallows. We ALWAYS have them in the house. This will be a MUST DO once I get some Crisco at the store!!! He’ll have a fabulous time doing this. Thank you for posting. Hi Yanilka! Nope. I just purchased different colors of sprinkles at the craft store. The finer the sprinkle the better. 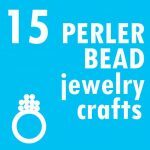 It may also be called “sanding sugar,” but any will work! these are just different colors of sprinkles, found in the craft store. I have done this with ground skittles, too, though! My daughter and I made red, white and blue crackers for July 4th. She had a blast! Although we rolled the marshmallows instead. Yay, thank you Audra! And great idea :). I love these! I plan to make them for my daughter’s rainbow Hello Kitty party this weekend. I have question though… can I make these a few days in advance? I’m afraid of the marshmallows getting hard. Hi Tahra, You CAN make them ahead of time, but I would say only 1 to 2 days. The water/sprinkle combo creates a sort of barrier around the marshmallow which keeps it soft inside, however, after they dry (an hour or so), line a large, flat tupperware container with a paper towel and place them in there, and seal. I’ve also just stuck them in gallon ziplocs and they last a couple days. Hey. Im doing these for a dr seuss party. Can i use koolaid too ? 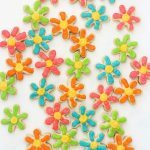 Hi Shaunda, You can dye marshmallows with KoolAid, but these are made by dipping in water, then in sprinkles, so the koolaid would dissolve. You can try brushing the marshmallows with light corn syrup and then adding Koolaid, but it may dissolve. However, I still think it would look cool dissolved! Hi. Has anyone tried roasting these after adding the sugar? I thought they would be pretty on a s’mores bar for a wedding. Hmm, that’s a great question Pam! I haven’t, so I’m not sure how it would work, but I think definitely worth testing!